A new report by Greenomics Indonesia documents how the Merauke Integrated Food and Energy Estate threatens peatland and forest in Papua province, Indonesia. The moratorium on new forest concessions, part of the US$1 billion Indonesia-Norway REDD deal has no effect whatsoever in limiting the destruction. Greenomics Indonesia’s report reveals that 400,000 hectares of land, including 350,000 hectares of peatland have been removed from the Moratorium Indicative Map when it was revised on 22 November 2011. More than 200,000 hectares of primary forests remain under threat from MIFEE’s oil palm plantations. 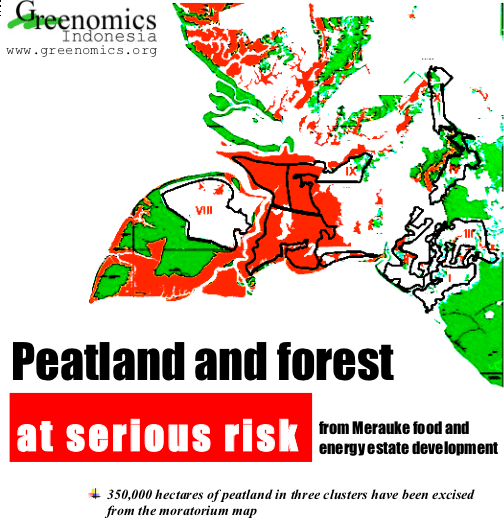 The report, “Peatland and forest at serious risk from Merauke food and energy estate development”, can be downloaded here (pdf file, 669 kB). The two-year moratorium was introduced in May 2011, several months after the deadline agreed between Norway and Indonesia. During the discussions about the moratorium, several loopholes were inserted, one of which excludes rice and sugar cane concessions. Clusters VI, VII and IX illustrated on the map above are partly allocated for rice cultivation. But some of the land in these clusters is allocated for livestock production, and growing corn and sago. These land-uses are not excluded from the moratorium. If this primary forest is not excluded from the two MIFEE clusters (IV and X) so that it can be made subject to the moratorium separately, then it is clear that its integrity will be seriously threatened by its conversion to other uses, particularly for the development of palm oil plantations. There is another twist to the MIFEE and the moratorium tale. One of the companies involved in the MIFEE development is the MEDCO Group, a huge Indonesian holding investment firm (its main business is oil and gas). Korea’s second largest corporation, LG, is reported to be running MEDCO’s plantations in Merauke. REDD-Monitor is offering no prizes for guessing which country’s sovereign wealth fund owns shares in both Medco Energi International and LG International. Step forward the Norwegian Government Pension Fund Global. In a presentation last week in a meeting about illegal logging at Chatham House in London, Jago Wadley, Senior Forest Campaigner at Environmental Investigation Agency, highlighted the hypocrisy of the Norwegian government’s claims to be reducing deforestation while at the same time investing in forest destroying companies. His presentation, titled “Norwegian Woods: Exploring Norway’s Contradictory Financial Incentives in South East Asia’s Land Use Sector”, can be downloaded here (pdf file, 2.2 MB). Almost two years later, Norway is cynically proving that Stoltenberg’s first statement remains true and that Norway actually committed to nothing. Wadley looks at the Norwegian Government Pension Fund Global’s (GPFG) profits during 2010 from 29 companies in Indonesia and Southeast Asia that are involved in forest destruction. In December 2009, the value of GPFG’s investment was US$437 million. By December 2010, the figure had increased to US$678 million – as a result of US$96 million new investment and an increase of US$145 million profit. During the same period, Norway handed over US$30 million to Indonesia under the two country’s big REDD deal. Norway could make 50% more from Asian plantations companies over five years than it might pay Indonesia for REDD over a similar period. And that’s without taking into consideration Norway’s investments in coal, mining or oil and gas. The situation of the indigenous peoples of Merauke continues to be dire and there has been no discernible change in policy or practice with respect to the MIFEE project (see paragraphs 14-20). Decisions that affect the indigenous peoples of Merauke and Papua more broadly continue to be adopted without their effective participation and without reference to their rights. These decisions are implemented and enforced in a highly prejudicial manner and indigenous Papuans continue to suffer extreme and pervasive discrimination and other serious violations of their human rights. Papua also continues to be heavily militarised and the military is often involved in protecting extractive operations and plantations on indigenous lands, as well as rights-violations more broadly. Moreover, the Papua Special Autonomy Law remains largely ineffective due to, inter alia, the lack of requisite implementing laws and action (see paragraphs 7-13 below). Yet now Greenomics has clarified how huge swathes of both primary forest & peatlands were indeed doled out for MIFEE, and subsequently carved out of the second version of the moratorium… The process shows how, while saying all the right things at the right time, the Ministry of Forestry is either powerless to influence land use across the country, or how it’s information is woefully outdated and each new moratorium map is merely playing catch-up with realities on the ground, until the moratorium expires and the whole country is once more up for grabs. LG International describes their investment in this Medco-led concession as “reforestation”. Once the original forests have been cleared and replaced with a mono-culture, I suppose it will be. The dynamic sconflict of interest among all parties to Papua are high. MIFEE was one examples of several case in Papua. Its goes to a conclusion that MIFEE can’t be stopped. Look at the Papua Spatial Plan which is until now not been signed yet by ministry of forestry. They got substantive agreement already but there still several revision again mainly on forest use. Leakage every where. The MIFFE projects and other investment in Papua are align with the master plan ACCELERATION AND EXPANSION OF INDONESIA ECONOMIC DEVELOPMENT 2011-2025 (MP3EI). And at the last year Indonesia President had realize an instruction about expansion of the development of Papua and West Papua Province which aimed to support the implementation of MP3EI. On the grassroots several national, local and international NGO are currently works on the strengthening the IPs position. Anyway that is a big homework for Papua at the moment some stakeholder had established the Low Carbon Economic Development Task Force for Papua and West Papua.